Local jewelry designers are developing a national following. Local artisan Anthony Gallaher has been making jewelry since the 1980s, but it wasn't until 2010 that he discovered his love of bronze work and reclaimed metal jewelry art. He repurposes metals like bronze, silver and copper from scrap yards by cutting and hammering them into eye-catching wearable art. Each necklace, earring and bracelet has a unique shape and texture, with a rustic, earthy vibe that can easily add a bit of shimmer to a casual outfit or complement formal attire. Gallaher also creates custom wedding sets, refashions heirloom pieces and can craft a precious metal adornment for just about anything. Find his jewelry at Pottery Place Plus and online. 2008 Coeur d'Alene High School grad Madison (Etheridge) Bodenmann created a successful jewelry business from what was simply a form of personal artistic expression just two years ago. 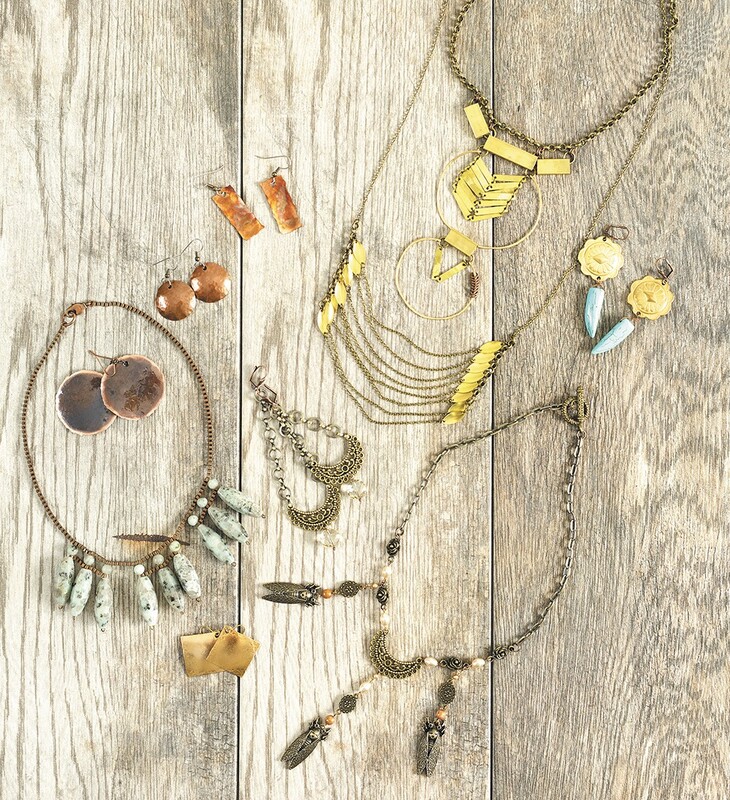 Her one-of-a-kind statement pieces combine a variety of metals, glass, vintage discoveries and semi-precious metals for a contemporary-meets-bohemian look. Bodenmann says she hopes to bring beauty into people's everyday lives with her jewelry, which is inspired by both nature and architecture. As if the sheer beauty of her jewelry wasn't enough to entice customers, she also sources her supplies locally whenever possible. Bodenmann now lives on Vancouver Island, but you can find her pieces at Marmalade in Coeur d'Alene and on her website. Hawaiian-born Summer Hightower is a local fashionista who has been dabbling in jewelry-making since she was 12 years old. She first started selling her funky-chic pieces out of a vintage suitcase at festivals, parks, bars and roller derby bouts. Now she's set up shop at her popular South Perry cottage boutique, Veda Lux, which is celebrating its fifth year in business. It's no wonder that her work has recently attracted local and national attention; her jewelry is handmade from vintage elements, refashioned antique pieces and a mix of earthy and brilliantly colored stones. The boutique also offers a variety of hand-picked vintage and modish clothing items and accessories at affordable prices.